Break the glass noodles into approx. 10 cm lengths, place in boiling water, remove from the hob, leave to stand for 4 mins., drain and set aside. Soften the mushrooms, drain and finely slice. Add the spring onions, celery, carrot and peppers with the mushrooms to the glass noodles and mix everything together. Combine the lime juice, soy sauce, chilli, coriander, sugar and sesame oil, add to the glass noodles, stir. Toast the peanuts in a little hot oil. Crumble the tofu, mix with the soy sauce, add to the peanuts and briefly fry. 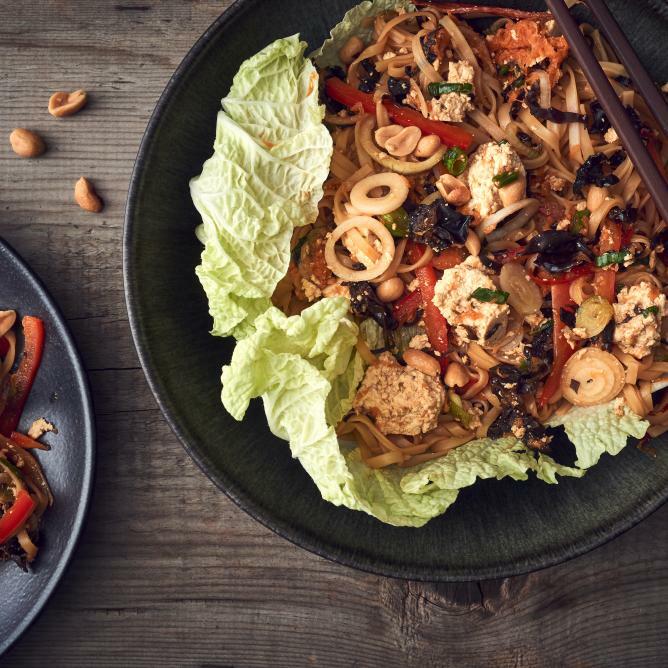 Fill the Chinese cabbage leaves with salad and garnish with the tofu and peanuts.